My husband has fond memories of his Mom sewing some of the clothes that he wore to elementary school. In honor of that, I thought it might be a fun tradition to make the outfit that my kids wear to the first day of school each year. My daughter starts pre-k on Monday (through part of the wonderful LAUSD SRLDP program) so I spent the last few days working on this little dress. I let her pick out the fabric and I made sure to pick out a pattern (Oliver + s family reunion dress) that wasn't too hard so I didn't totally screw it up. While I enjoy quilting, I do not enjoy sewing clothes, but it was a fun activity for my daughter and I to do together. We spent an hour or so for the past few days while my 2 year old was napping and she sat at the kitchen table with me while we worked on the dress. I had Harper try the dress on today to make sure that it fit. She was excited to also try on her new school shoes. Harper picked the fabric, which is a Lisette fabric from Joann's. It's really cute, but it wouldn't have been my first choice because it is very light weight and a little see through, so she is going to wear leggings and a tank top underneath. This was a great pattern for me because it isn't very difficult and there was a sew along last year which had lots of helpful tips and photos. I will definitely be making another one of these in the future. Very adorable. She looks like a little model! She certainly thinks that she is. What a great way to prepare for the beginning of school. 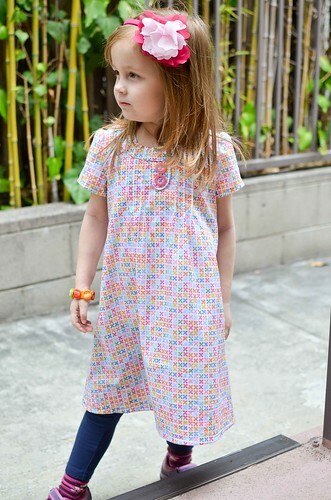 I love this dress pattern and used the sew along, too. I hope your daughter has a wonderful school experience this year. So cute! And it's great that you are carrying on with Doris' fine tradition!